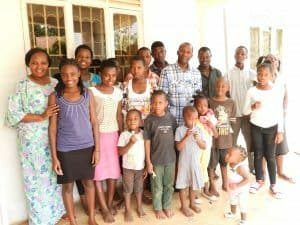 Following a wonderful fun fundraising afternoon tea at St Johns in early December, Debbie Walker set out on the 21st Dec to celebrate a very special Christmas with Bishop Ivan, Madam Allen (his wife) and other members of the Lugoloobi household. There was a wonderful Christmas atmosphere with a packed house which included several of the Champions who were staying with the family over the school holidays. (Most champions return home to extended family during the holidays ,but there remain a small number who have no one to support them during this period). The money raised from the fundraising afternoon tea helped support these champions during the Christmas holiday period. Shirts, toys and and other much needed clothing were received with huge appreciation on Christmas day along with a lovely meal. It was a truly memorable Christmas with much love, laughter and excitement. I felt very blessed and privileged to have been part of such a loving family.